Best darn dealers on the planet! 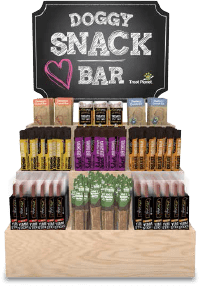 Promote your Treat Planet products in your store with the aid of one (or many) of our Treat Planet Product Displays. They’ll take your merchandising game to a whole new level. INTERESTED IN FLOOR DISPLAYS? CLICK HERE! A countertop wooden display to showcase your Etta Says! Munch-Meter™ Chew Selection. Featuring 9 different proteins and three hardness levels, this product selection will meet any dog’s preferences. All chews are naturally displayed with UPC band for easy checkout. Top rated POS items all in one display. 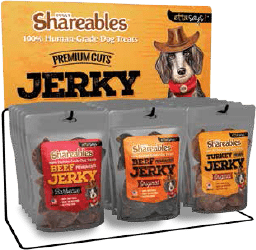 Showcases all Treat Planet brands –Etta Says!, Hare of the Dog, and Snicky Snaks. Uses a limited amount of counter-top space. 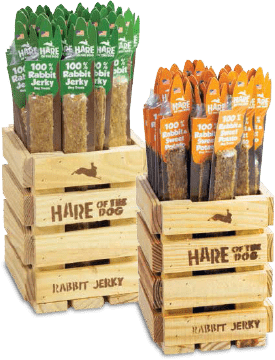 A convenient way to display your Hare of the Dog Rabbit Recipe Treats! Available as a 3 prong or 6 prong rack. Can you be used for both clamshells and bagged treats. The best way to showcase your Etta Says! 100% Human-Grade Jerky. 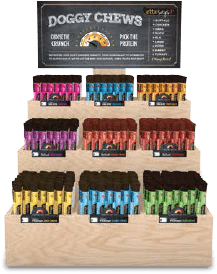 Featuring 3 all flavors of our premium cut jerky, this display is certain to make an impact. A small footprint to showcase our most popular chews – Etta Says! 4inch Premium Crunchy Chews. Display three POS Crunchy Chews to capture last minute impulse buys. Featuring 3 all flavors of our premium cut jerky, this display is certain to make an impact. Rustic, eye-catching display featuring Hare of the Dog Jerky. Available in 100% Rabbit formula or Rabbit and Sweet Potato. 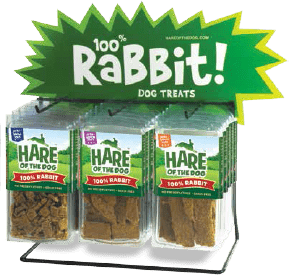 Single serving treats are a great way to introduce the benefits of rabbits to your customer. 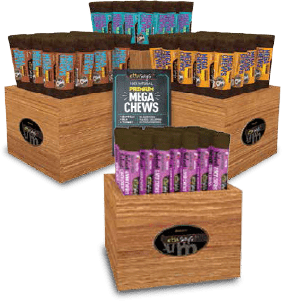 MEGA sized versions of our popular Crunchy Premium and Select Chews. Display is available with either 1 or 3 compartments. Mix and match proteins!